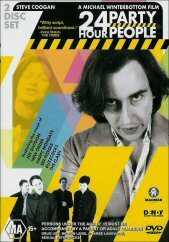 This film, which takes its title from a Happy Mondays song, takes us on an intriguing ride into the Manchester music scene circa 1980, when a bloke by the name of Tony Wilson opened a music venue called The Hacienda, and founded Factory Records. The record label existed with an idealistic structure involving a complete lack of recording contracts, and supposedly total freedom for the bands it represented. The main musical acts featured in the film are namely Joy Division, who ultimately became New Order after the tragic suicide of frontman Ian Curtis, and the Happy Mondays. Many other famous bands of the time graced the stage of the Hacienda, including Siouxie and the Banshees, The Jam, and Iggy Pop. It�s a fascinating film for anyone interested in the music of the era, however the one major drawback is that none of the characters are really very likeable. It�s difficult to empathise with Tony Wilson given that he is presented as quite the pretentious, idealistic prat. Similarly, the bands, producers and Wilson�s cronies are painted as a bunch of drug-addled, cantankerous tossers, which whilst possibly being historically accurate doesn�t really give the audience any reason to care what becomes of them. Even taking this into account, however, I wouldn�t hesitate to call this a good film. The video is of good quality, although at a few points there is footage of actual bands of the era playing intercut with the rest of the film, and this footage is generally of a considerably lower quality than the rest of the picture. It�s only to be expected though considering the age of the material being used. Audio, too, is good, and the soundtrack is very rockin�, as one would expect of a movie of this nature. Plenty of examples of fine Manchester bands on offer to complement the story. There is an absolute bucketload of extras included in this two-disc set. Two very interesting commentary tracks, one featuring the film�s producer and Tony Coogan, who plays Wilson, and the other with the real Tony Wilson himself. A swathe of interviews with band members and people of interest offers further insights into the true history of the Hacienda, along with a piece about the genesis of the story, picture galleries, and a feature about the real Tony Wilson. Plus assorted other goodies to numerous to list! Overall I have no hesitations in recommending this disc to ANYONE with an interest in music history, particularly the British music scene of the early 80�s. The film is eminently watchable, with good audio and video, and an absolute plethora of extras. Highly recommended.